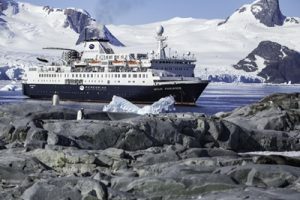 Peregrine Adventures has launched an Antarctica earlybird sale on their Ocean Endeavour charter with up to 20% off select voyages* in 2020 and 2021, if booked before 31 March 2019. As part of the launch, Peregrine is offering all agents two exclusive offers. Until 31 March 2019, all agents need to do is sell a berth on a Peregrine chartered voyage to Antarctica to get 50% off** the cabin price for themselves. One lucky agent and their companion will also win the adventure of a lifetime – a cabin of their very own on one of Peregrine’s first ever chartered voyages to the great white continent. The more berths the agent sells, the more chances they will have to win. The incentives come following the announcement earlier this week of the refurbished Ocean Endeavour charter with Intrepid Group and its venture partner Chimu Adventures. The sale and incentive is open to agents who book through Peregrine Adventures or Chimu Adventures. Each time an agent books a customer on a voyage on the Ocean Endeavour for the 2020 and 2021 season, the agent goes into a prize draw for two berths on select dates on an Antarctica Adventure. The prize will include return flights from the East Coast of Australia to Ushuaia via Buenos Aires. “We are thrilled to be giving agents in Australia and New Zealand the chance to experience the area at half price, so they can learn more about this important part of the world while travelling in a sustainable way,” said Brett Mitchell, Asia Pacific Regional Director for Peregrine Adventures. The Earlybird deal is for Peregrine and Chimu trips aboard the Ocean Endeavour where there will be an expedition crew member for every eight travellers and guests can learn about the history, geography and wildlife of the Antarctic from experts in fields including marine biology, glaciology and history. Each trip is carbon offset by Peregrine, and the company has a strong focus on sustainability, serving only sustainably-sourced seafood, avoiding single-use plastics and using biodegradable and phosphate-free cleaning products onboard. The 11-day voyage lets guests view wildlife at one of the most active times of year, over the festive season. Celebrate Christmas by spotting penguins, seals and whales in the midnight sun. This voyage also offers kayaking, photography masterclasses, onboard yoga and massages. Guests also have the chance to camp out overnight to truly get amongst the polar elements. The 11-day voyage lets guests ring in the New Year in the final frontier and enjoy a once in a lifetime party aboard. Guests will see Adelie, chinstrap and gentoo penguins, or spot minke and humpback whales from the deck. After a day of exploration, guests can relax and enjoy the ship’s health and wellness offerings including a heated saltwater pool, sauna and gym. This 10-day voyage is the ultimate whale spotting experience in the region. When whales are spotted, the crew will launch Zodiacs allowing guests a closer look at the magnificent creatures as they cruise through the Antarctic waters. Scouting for minke and humpback whales as well as orcas during peak season, this is a must for wildlife-lovers. Any travel agent booking a passenger on the new 2020/21 Ocean Endeavour Antarctic product between 10 December 2018 and 31 March 2019 will be entitled to take themselves on a journey on one of the 2020/2021 Antarctica departures on the Ocean Endeavour for 50% of the retail price. Offer extends to all sailings and all cabin categories (note that cabin Categories 8-10 cannot be booked on a male or female share basis). Offer is conditional on individual still being a travel agent at the time of departure (deposit will be refunded if not). This offer will be limited to a maximum of 30 people to get in fast to guarantee your berth.